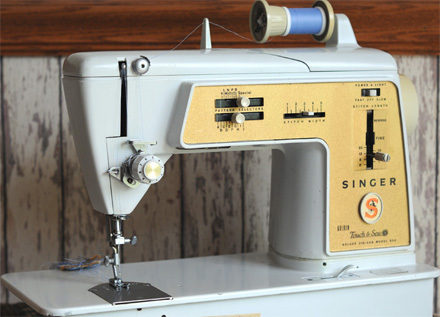 This Singer 620 may seem like an improvement on the popular slant-needle machines. 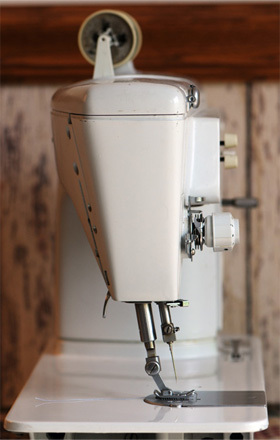 in fact, it does have several new gimmicks such as a needle threading aid and a bobbin that is easy to fill. However, for someone who wants to collect an older machine for serious use, this may not be the best choice. The reason we say this is because the 620 machine has nylon gears. Nylon gears, sometimes referred to as "plastic" may deteriorate with age. They appear to be biodegradable. A Singer repairman also told us not to lubricate nylon gears as petroleum may accelerate deterioration. In any case, if one of these machines is purchased for home use, check the gears to ensure they are serviceable. 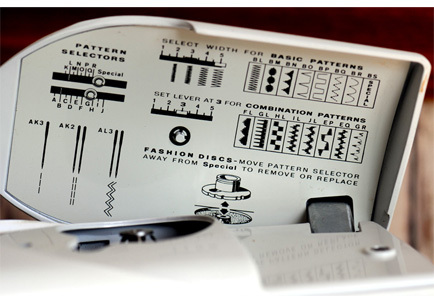 Unlike the 500 and 401 which has rotating dials, the 620 uses sliders to select stitch patterns. These controls can be seen above. Form follows function. There are no frills on the back side of the Singer 620. The machine has an internal motor and no drive belts. It is gear driven. 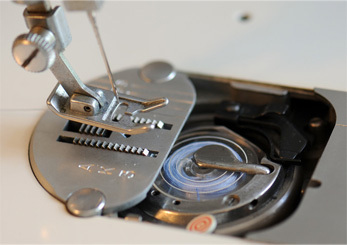 The raised lid shows common stitch patterns that can be sewn on the Singer 620 using its built-in stack of cams. The diagram shows control settings for each pattern. Many other patterns are available and disks can be used to add to the variety. 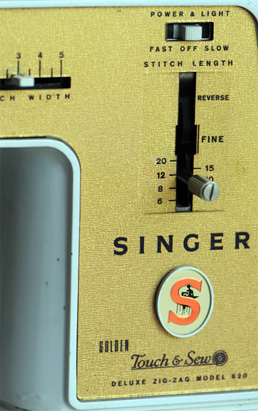 The Singer 620 has a switch which can be used to select either fast or slow speed. The slow speed on our machine makes a vibrating sound. This appears to be a normal indication on machines with a fast/slow speed setting. 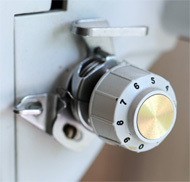 This switch can be seen above the stitch length selector. The Touch & Sew have been referred to as "Cuss and Throw" when the nylon gears fail. Also warped plastic bottoms on T & S machines is inherent. Apparently some bottoms were warped on new machines when they were unpackaged. Our warped bottom was cropped off the image at the top of this page. 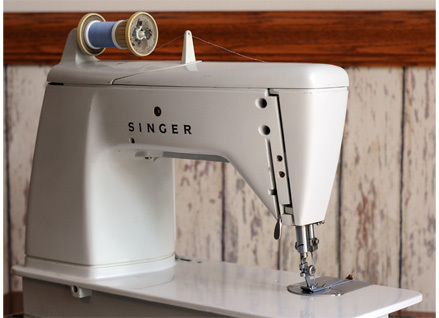 The above image shows the slant needle of our Singer 620. Slant needle technology is seen on our 401, 500 and this 620. This image shows a plastic horizontal bobbin. The bobbin can be wound without unthreading the machine. To thread the bobbin, depress the red button in the lower part of the image. Concentric rings show amount of thread wound which should not be beyond the outer ring. This image also shows the generous feed dogs and a 1/2-inch wide presser foot.